For a perfect blend of smooth ride and support, look no further than the lightweight Merrell Capra Sport Gtx sneaker. Offering exceptional comfort and support, this eye-catching women's hiking shoe boasts of enhanced traction and stability thanks to its Vibram MegaGrip outsole. Resting on top of a UniFly midsole that connects you to the trail and protects you from the terrain, it also features a molded nylon shank and EVA molded footbed that provide superior underfoot support for an easy and comfortable gait. GORE-TEX waterproof membrane repels moisture and enhances breathability, while breathable mesh lining treated with M Select FRESH repels odors away. 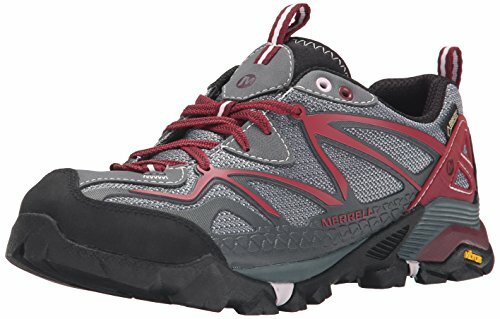 Probably the cheapest price for Merrell Women’s Capra Sport Gore-Tex Hiking Shoe is available in this store. This store offers the best price for Merrell Women’s Capra Sport Gore-Tex Hiking Shoe, great deal!